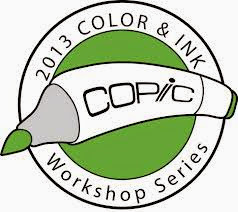 I'm off to spend the day teaching an Introduction to Copics class. I really enjoy teaching the intro class. It is so fun to see students discover how awesome these markers are. I can't wait to see what they do with them. Ironically, today's card doesn't use copics. I made this card a while ago, but I didn't get a chance to get it on the blog. There is snow in the background of the photos. I'm so glad that it has melted!! I love the softness of these flowers. I think I will make a bunch of these to have on hand. The stamps are from Stampin Up. I'm not sure if they are retired or not.